Although Rohan clothing is typically considered synonymous with exploring and usually depicted on scenic mountain tops, jungle trails, dried out river beds or remote desert locations, one shouldn’t underestimate the effectiveness of the clothing range in other less obvious settings either. As a long-time customer of Rohan, I have enjoyed the benefits of wearing Rohan clothing for decades, in fact ever since the first store opened in Long Preston all those years ago. Having lived and worked abroad for over 26 years I have worn and valued various items from the range during extensive international travel and offshore work assignments throughout my long career in the oil industry. But it’s in my role as a senior motorsport official that I gain the most value from several pairs of the ubiquitous black Rohan Bags. I spend a lot of time on race circuits in the UK, the Middle East and around the world as a Senior Race Official, responsible for event safety, command and control and compliance with sporting regulations for various categories of motorsport events, from karting to Formula 1. 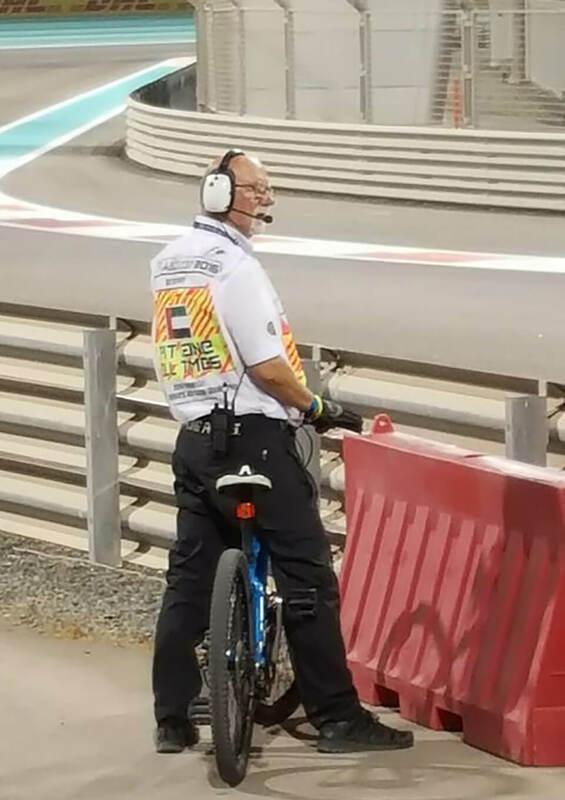 Each year I also officiate as Sector Chief at the season finale Abu Dhabi Formula 1 race where I am located trackside, supporting the Race Marshals, and liaising with Race Control ready to respond to any crashes or incidents in my allocated sector. Whether it’s at a cold, wet and misty day at Knockhill motor racing circuit in Scotland, or under the blazing sun at the Al Ain kart racing track in the desert in the United Arab Emirates (UAE) or the equally oven like temperatures and humidity of the Singapore Formula 1 night race, or the famous Bathurst circuit in Australia where all 4 seasons can be experienced in one day, my black Rohan Bags form the foundation of my race officials uniform. As a race official, Rohan Bags tick every box for me; compact to pack and with ample multi-pocket storage, I can wear them casually for overnight air travel to and from the event, going out to dinner or a beer in the evening, they’re smart enough for the drivers briefing, operational meetings and work in Race Control, yet durable enough to withstand the rigours of being out on track clambering over crash barriers or recovering crashed cars, roomy enough to cycle around the track performing safety inspections or driving a Fast Intervention Vehicle to incidents on the circuit, and most importantly, so lightweight and comfortable for working trackside for 8+ hours a day in temperatures of 33+ degrees under the blazing sun. And of course, as my wife will testify they are and easy to wash and quick to dry, ready for the following weekends event. The highlight of my motorsport year is invariably the spectacular Abu Dhabi Formula 1 Grand Prix and as the photos below depict my recent 10-day trip to the 2016 season Formula 1 finale at the vast world class Yas Marina circuit typifies the punishment that I dish out to my Bags at race events week after week.